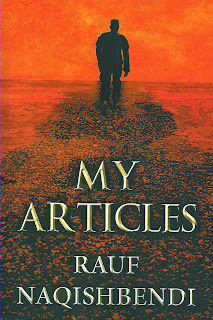 "My Articles" Book Event with Author Rauf Naqishbendi, Dec. 7th at Florey's! 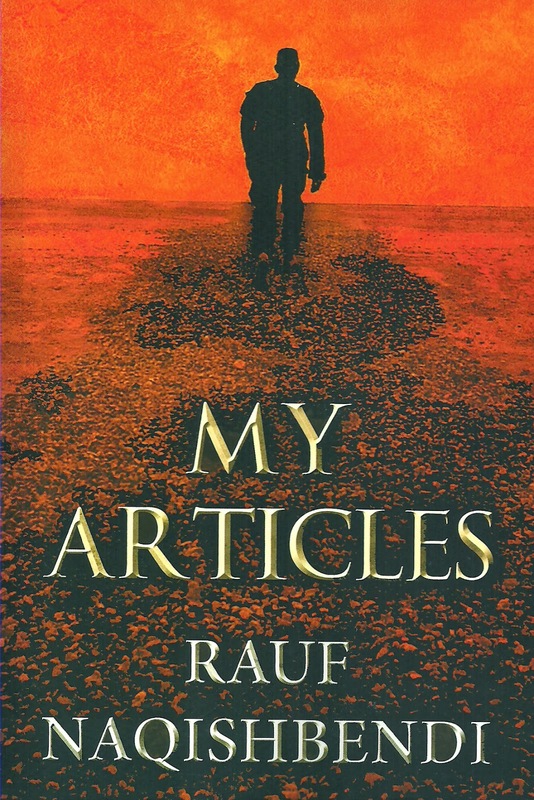 Florey's Books welcomes local author Rauf Naqishbendi as he discusses his new collection "My Articles". This is a collection of columns published from 2002-2013 through several web media sites. These articles encompass historical events from the Iraq War onset to American troop withdrawal. Commentaries include the process of framing the Iraqi constitution and democracy in Iraq and persistence on partitioning Iraq to more than one country. These articles also deal with the Kurdish dream for an independent Kurdistan and, from the Kurdish perspective, defend the formation of a sovereign Kurdish state. While considering the Iraq War, in which the Turks were proven perfidious toward America, the author calls for thwarting American political, military, and monetary aid to Turkey. The author also calls for the Turks to come to terms with past genocide against defenseless Armenians and their half-century genocide against their Kurdish population. Also covered are American politics and democracy, humanities, religion, terrorism, and Middle East chaos. Mr. Naqishbendi is also the author "The Garden of the Poets", an autobiography. 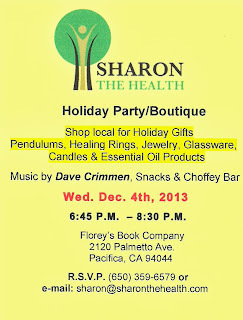 Sharon the Health Presents: Holiday Boutique and Party, Wed. Dec. 4th at Florey's! 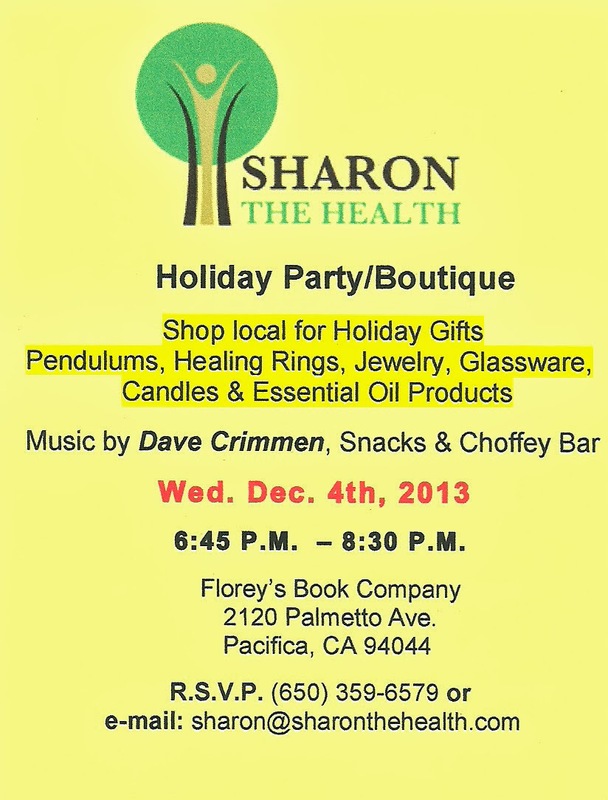 Florey's Book Co. welcomes Sharon Caren of Sharon the Health and local artists. Shop Local for your Holiday gifts. Live music by Dave Crimmen and The Jordanettes! 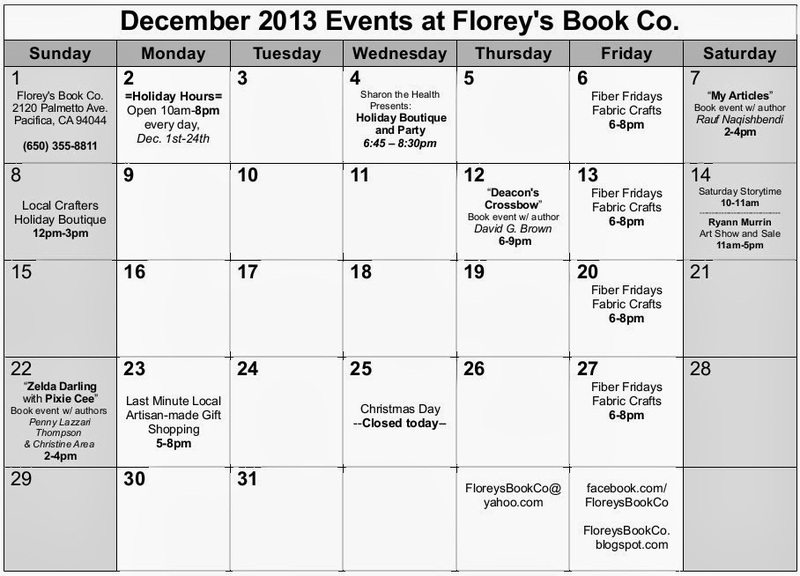 December 2013 Events at Florey's Book Co.! 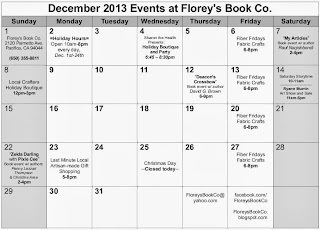 Florey's extended holiday hours are 10am to 8pm every day! Our holiday hours run December 1st to December 24th. We offer free gift wrapping on any purchase! Please note that we will be CLOSED on December 25th for Christmas Day. Local gifts, live music, essential oils and more! Historical and current events articles published 2002-2013. Hand made gifts from local crafters! The true story of a crossbow killing on Interstate 95. -"Zelda Darling with Pixie Cee"
A fun young-adult book set in San Francisco. One last chance to get some local made one of a kind gifts! Open 10am to 8pm every day (Dec. 1st-24th)! Pacifica Writers' Forum, November 21st at Florey's! 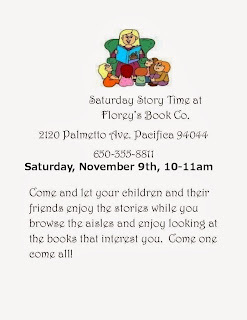 Florey's Books invites you to the Pacifica Writers' Forum. 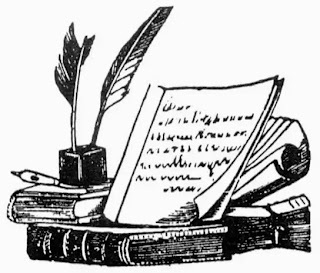 The Pacifica Writers' Forum is open to all readers and writers of fiction, nonfiction and poetry. The Pacifica Writers' Forum meets the third Thursday of each month. 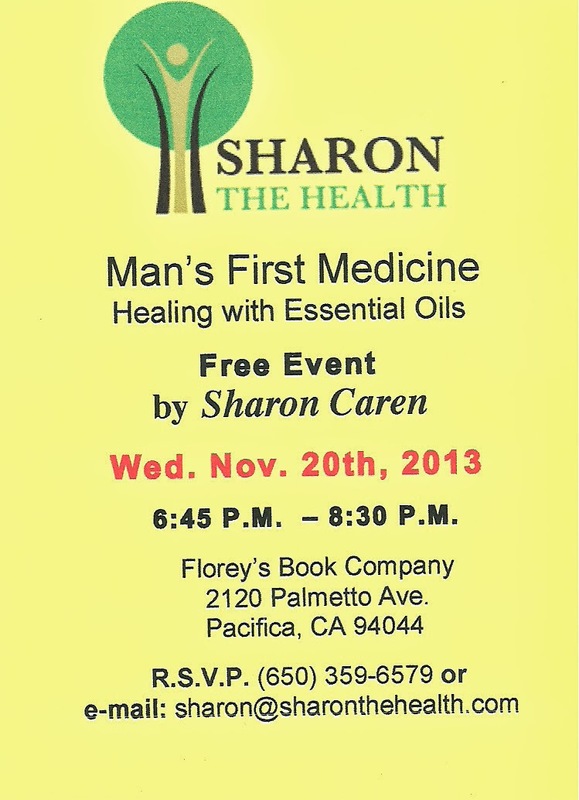 Sharon the Health Presents: 'Healing with Essential Oils', Wed. Nov. 20th at Florey's! Florey's Book Co. welcomes Sharon Caren of Sharon the Health as she discusses healing with essential oils. I’ve been using Essential Oils for natural health and healing since 1999. My passion is to share with you my life changing experiences: How I’ve eliminated toxins, prescriptions, and over the counter drugs from my life as well as for my family, our pets included. 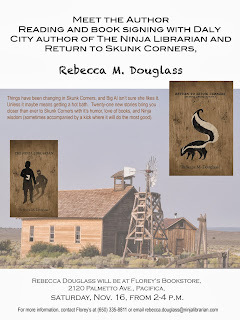 "Return to Skunk Corners" Book Event with Author Rebecca M. Douglass, Nov. 16th, 2-4pm at Florey's! Florey's Books welcomes author Rebecca M. Douglass as she reads from and discusses her new young adult book: "Return to Skunk Corners: The Ninja Librarian Book 2"
Things have been changing in Skunk Corners, and Big Al isn't sure she likes it. Unless it means a hot bath. Twenty-one new stories bring you closer than ever to Skunk Corners with its humor, love of books, and Ninja wisdom (sometimes accompanied by a kick where it will do the most good). This second book in the Ninja Librarian series shows the continuing struggles as the town becomes a community and as Al finds new ways to accept responsibilities she never thought she wanted. Rebecca M. Douglass grew up in Idaho, Arizona, and Washington states, and now lives near San Francisco with her husband and two teenaged sons. Her imagination resides where it pleases, in and out of this world. After more than a decade of working at the library, she is still learning the secrets of the Ninja Librarian. Her passions include backpacking, hiking, books, and running and biking. She works at the library, volunteers in the schools, and drinks too much coffee while writing. Other books by Ms. Douglass include 'The Ninja Librarian' and 'A is for Alpine'.